Front and back gardens are for grass, water features and maybe a few swings, not masses of DIY and builders waste. So if you live in Lower Edmonton N9, would like to reclaim your outside space, and are looking for a reputable firm who can deliver a same day service, look no further than Away With It! We provide builders waste removal Lower Edmonton homeowners and building contractors can rely on for quality and convenience. All at competitive prices! As highly professional, licensed waste carriers, we won’t only do our best to reuse or recycle 80% of the waste we handle, we’ll also make sure everything else is properly and legally disposed of too. We work all over Lower Edmonton N9 from sunrise to well past sunset (7am – 11:30pm), seven days a week. Working with us is easy peasy. Just call us up and we’ll give you a two hour timeslot to suit you. Then, an hour before we’re due to visit, we’ll call ahead to confirm our ETA. When you book our service we’ll give you a free, no obligation estimate, inclusive of all labour, transportation and disposal fees. 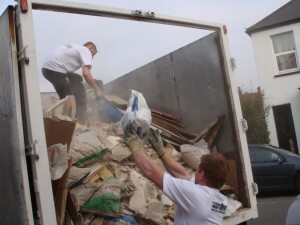 Our Lower Edmonton N9 DIY and builders waste removal service only ever takes into account the amount of space your waste takes up in our van too, so you can be sure of getting a price that will suit your wallet. And there will be no nasty surprises at the end of the job. And on top of all that, we’ll even use our own dust sheets if we have to move waste through your home, and give your surfaces a good sweep before we leave too! 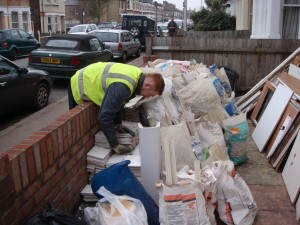 To find out how much time, money and hassle we can save you on builders waste removal Lower Edmonton N9 call us on 0208 504 7390 or 07957 123019 and arrange a consultation. If you can’t pick up the phone, head over to our handy online form, fill in the necessary details and we’ll get back to you with a quote fast.